File System Protector is a powerful utility which uses a kernel-mode driver to completely lock a file or a folder and to deny write access to files (allow read-only). You can write rules for any process or only for specific processes, you can lock files or folders and you can also protect files from modifications (write access) so that processes can only read the file content, but not hijack or modify it. 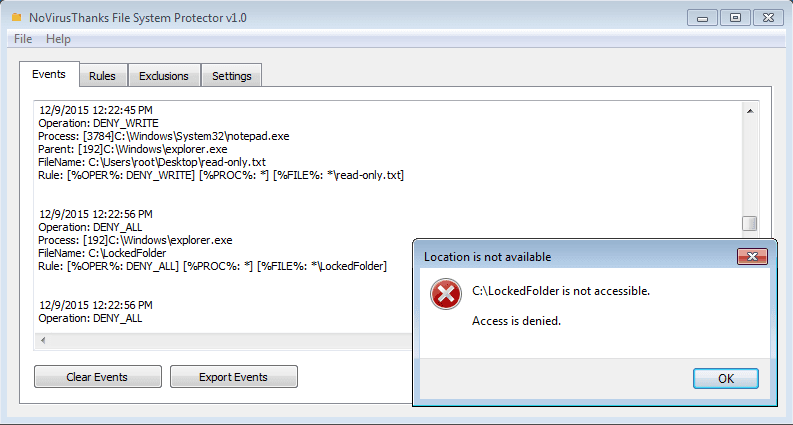 Prevent the modification of specific files and folders from unknown processes, allowing only trusted processes (i.e notepad.exe) to access or modify a file or folder. You can deny write access to files, lock folders and files, and protect sensitive files and folders from unauthorized accesses or modifications. Thus you can use this tool to prevent ransomware from accessing a folder or file. Protect files and folders by denying write access from unknown processes. Completely lock a file or a folder on a per-process basis with simple rules. Write rules to allow only trusted processes to access and modify files and folders. Use wildcard characters in your rules to match processes and files, i.e *\notepad.exe. Show useful information when an action is blocked (i.e process name, file name, etc).